The stomach flu has been particularly brutal this winter. In fact, it’s infected four out of five of my family members so far and I have a feeling it’s not done yet. You would think that the 24 hour stomach bug would last just a day, but my youngest didn’t start feeling better until at least 4 full days had passed. It was a HORROR SHOW. And you know what? We are still in the thick of it. If your family is in the same boat, I wanted to write a post that you could read that summed up everything you needed to know – all in one place. 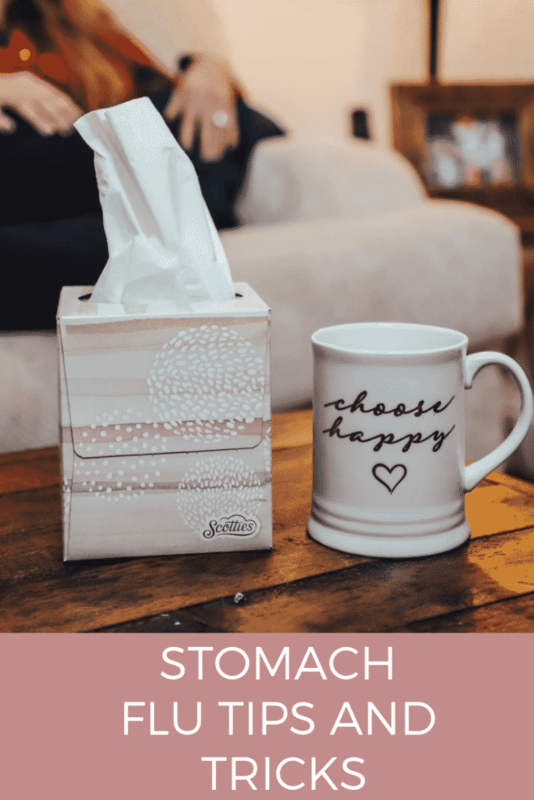 What Are Some Stomach Virus Symptoms? Watery, usually non-bloody diarrhea — bloody diarrhea usually means you have a different, more severe infection. Occasional muscle aches or headache. Now, I want to make a note about this section. My son was vomiting blood – or so I thought. I rushed him right away to his doctor because I read that if you notice any blood in your vomit that you should visit your doctor right away. Turned out that his nose was bleeding from all the vomiting and he wasn’t throwing up blood, he was just throwing up the blood that he was swallowing from his nose. That made me feel MUCH better. But be on alert for this symptom! The number one stomach flu symptom that you have to watch out for is dehydration. How can you tell if you or your children are dehydrated? Look for signs of weakness or dizziness. Call your doctor if you notice this. If you are unable to keep any liquids down, call your doctor. If you see blood of any kind in your stool or in your vomit, call your doctor. If you feel uneasy, call your doctor. I am not a nurse. I am just a mom. This is not gospel. This is just what I’ve learned. Please, understand where we are coming from. There isn’t a lot that you can eat while you are this sick, but there are a few staples you should keep in the house. Bananas, Rice, Applesauce, and Toast – KEY ITEMS. Also, think about ice chips as food. Ice pops as well. Pedialyte is your best friend. Your literal best friend. Gatorade, too. Think about bland foods that you can make and stick to just that. I gave my son animal cracker, regular crackers – things like that. He kept it all down for about 10 minutes and then we tried again. It’s a test. A real test. At the end of the day, you just want to make sure that your kids keep drinking. My doctor made one thing clear – no dairy. The stomach flu in kids is so hard to watch. I have to tell you right here and now that everything you do will come right back up. So, you make them drink a half a glass of water and then ten minutes later, they will throw it all up. Don’t get frustrated because SOME of that liquid made its way into their system. You have to hope. Just don’t make them CHUG anything. Don’t sit there and say, “keep drinking – one more sip. Come on Lil Tommy, just one more sip. Ok, now one more! One more for Mommy!” Because if you force too much down at once, you will guarantee a bodily rejection. Is The Stomach Bug Contagious? Um. Yes. There is an incubation period of about 12 – 48 hours, BUT the person can be contagious during the incubation period PLUS for as long as they shed virus (usually about three days after symptoms stop but sometimes up to two weeks). WHATTTT?????? KILL ME. Like I said – 4 out of 5 family members are DOWN right now. I bought Lysol and am walking around like a priest on a mission. I mean…. please. No one is safe. The dog isn’t even safe. Ok, I don’t know if that is true or not. But you know what I am saying. This stomach virus is a doozy and takes no prisoners. How Long Does The Stomach Bug Last? Most people who get a stomach virus experience symptoms for 1-3 days but diarrhea may persist for as long as 10 days with some viruses. Just be sure to stay hydrated during this time, wash your hands as often as you can, and try to get plenty of rest. How Quickly Does The Stomach Bug Show Up? The Rotavirus – the leading cause of viral gastroenteritis in infants and young children — usually appears one to three days after exposure. So, it has a pretty quick turnaround, guys. This means if you have a big vacation coming up, stay home for a the few days before you need to board the plane. LOL! This is what my family does whenever one of our kids are sick. We usually take that sick child and board them up with one parent in the parents’ bedroom. We make it really fun for the sick child – allow them to watch whatever they want and cater to their every need. This also minimizes the risk of exposure for the rest of the children. If that is not possible, then give the sick child one side of the couch and put everyone else on the other. You really need to keep everyone apart. Although, like I said, we are basically all sick right now…. so maybe don’t listen to me because obviously, it’s not working. Don’t touch their faces – specifically avoiding their eye, nose, and mouth regions. Wash their hands as often as they can. I wish you the best of luck. I truly do. As a reminder, this is just one struggling mom talking to another mom. I am not a nurse or in any way affiliated with any medical profession. I have just been through this 50 times and felt like someone out there might need these tips during a state of desperation. I was there a few days ago when I saw the blood in my son’s vomit. I rushed right away to the Internet and did some reading about what it could be and then called my doctor immediately. Hopefully, you can use this post as a starter point to contact your doctor as well. Do you have any tips that you’d like to share regarding the stomach bug? Please share if you do! Uuuuugh. It is SO bad this year. I actually got it two days after Christmas. No one else in my family got it but no joke, I wasn’t better for AT LEAST A WEEK. (I mean, to fully recover. The puking only lasted 24 hours.) It is brutal. Hang in there! Whenever there is the first sign on any illness. I take the hand towels out of the bathrooms and replace it with paper towels.